This comprehensive handbook gives an informal introduction to mathematical and computational principles governing numerical analysis, as well as practical guidelines for using over 130 elaborate numerical analysis routines. It develops detailed formulas for both standard and rarely found algorithms, including many variants for linear and non-linear equation solvers, one- and two-dimensional splines of various kinds, numerical quadrature and cubature formulas of all known stable orders, and stable IVP and BVP solvers, even for stiff systems of differential equations. The descriptions of the algorithms are very detailed and focus on their implementation, giving sensible decision criteria to choose among the algorithms and describing the merits and demerits of each one. 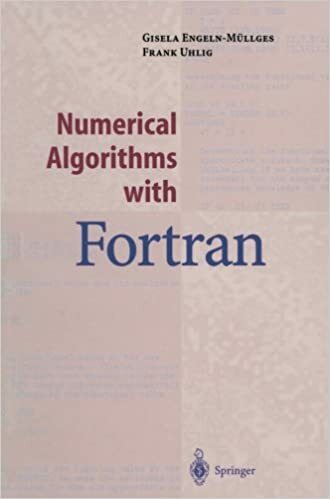 “Numerical Algorithms with Fortran” is a depository of highly useful and effective algorithms and codes for the scientist and engineer who needs to have direct access to such algorithms. The programs have been widely field tested. The enclosed CD-ROM contains all computer codes, both for Fortran 77 and compatible with Fortran 90, a compiler, and a test bed of programs and data for most algorithms. Each program includes detailed comments and describes available options, all clearly marked, with a complete list of error codes, etc.